Kare Kare is a traditional Filipino stew which is normally made with oxtail and vegetables simmered in a rich peanut butter sauce. While the real deal is absolutely delicious, it’s also rather time-consuming and requires a few ingredients that you might have trouble finding unless you happen to have a Filipino market nearby. 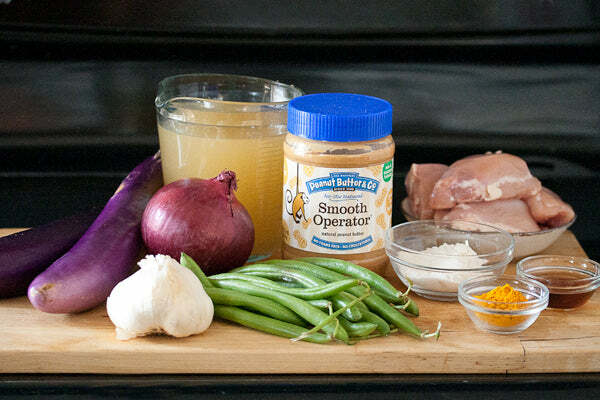 For the rest of us, I’ve concocted this quicker and easier version using boneless skinless chicken thighs that can easily be made on a regular weeknight using ingredients any well-stocked supermarket should carry. It’s fresher and lighter than the original, but no less delicious, and it comes together in just a little over half an hour. 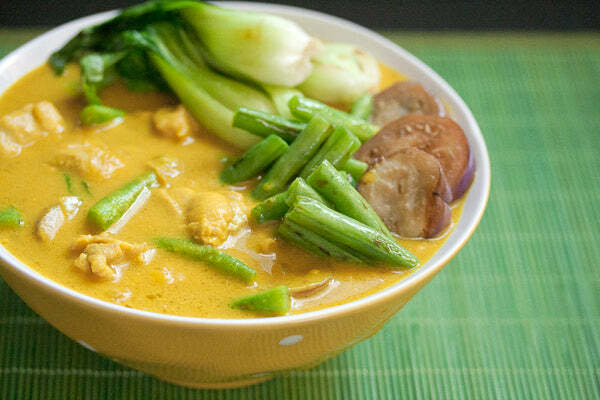 The characteristic golden-yellow of proper kare kare comes from annato paste, which is sold in many Latin American, Mexican, and Filipino markets. Don’t sweat it you can’t find it, though – turmeric is a perfectly good substitute, albeit not an authentic one. 1. 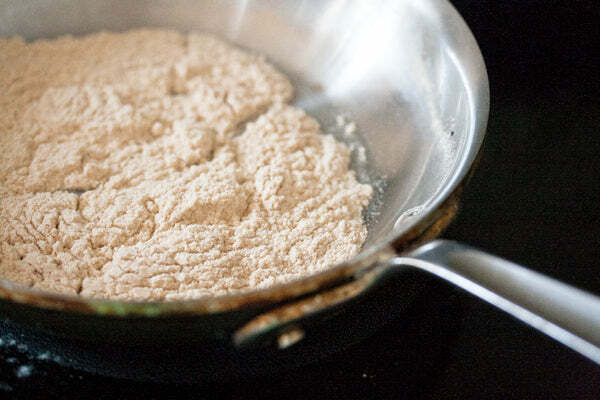 In a dry skillet set over medium-high heat, toast the rice flour for 5-7 minutes or until pale golden-brown and nutty in aroma, shaking frequently to ensure it toasts evenly. Remove from heat and set aside. 2. 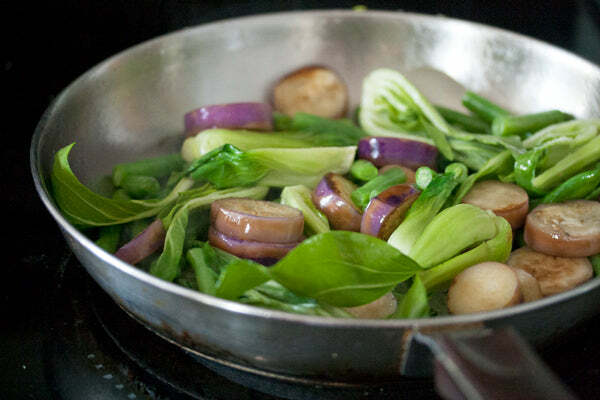 In a large heavy-bottomed saucepan set over medium-high heat, saute green beans and eggplant in olive oil for 3-5 minutes or until tender and lightly browned. 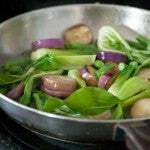 Add bok choy and saute for another 2 minutes. Transfer to a bowl and set aside. 3. 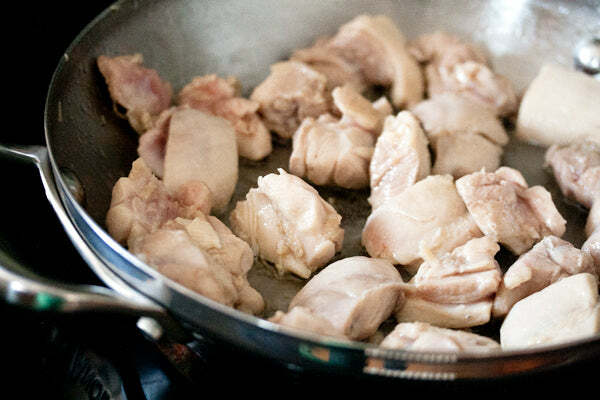 Add chicken thighs to the pan, and cook for 7-8 minutes or until well browned. Transfer to a plate and set aside. 4. 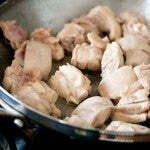 Add onions and garlic to the pot, and saute for 5-7 minutes or until soft and translucent. 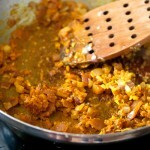 Add annato and cook for 1 minute longer. Pour in stock and fish sauce, bring to a boil, then reduce heat to low. 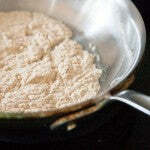 Whisk in peanut butter and toasted rice flour, stirring well to break up any lumps. 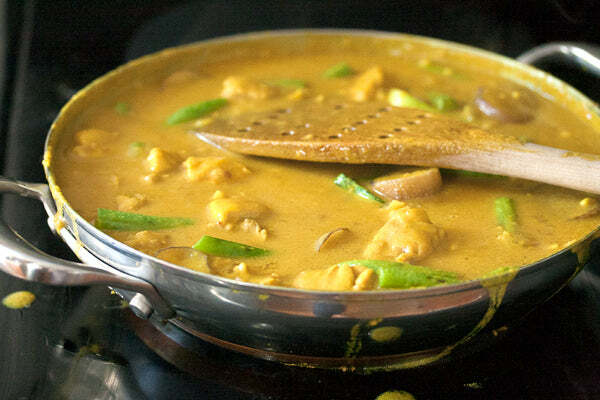 Return chicken to the pot, and simmer, uncovered, for 15 minutes or until chicken thighs are cooked all the way through and sauce is thickened. 5. 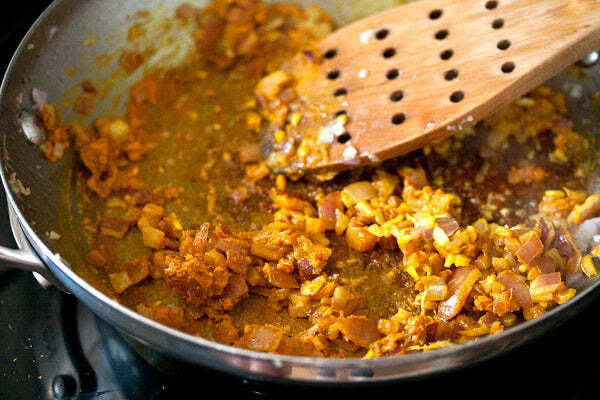 Stir in the cooked vegetables and simmer for 2-3 minutes or until eggplant is warmed through. Remove from heat. Taste and adjust seasoning with salt, if necessary. 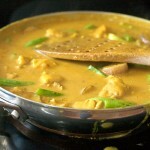 Serve the stew immediately on a bed of freshly cooked white rice. 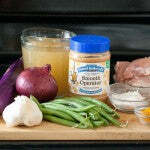 What is your favorite savory food that contains peanut butter? – The giveaway is open to USA residents only and will run until Monday, December 8th, 2014 at 11:59 PM EST. – Winner(s) will have until 12/17/14 to claim their prize or we will choose another winner. 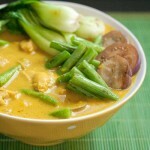 The post Peanut Butter Chicken Kare Kare appeared first on - Peanut Butter & Co. Recipe Blog.